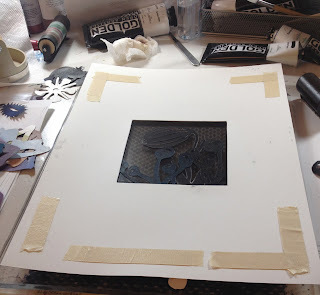 I thought that today I would show you how I am doing my registration for my monoprints on the gelli plate. First of all I splurged and bought the giant sized plate - 12" x 14". At first I was too overwhelmed to try it. I thought I had to work big. But as it turns out I do not. In fact I am working smaller than ever. 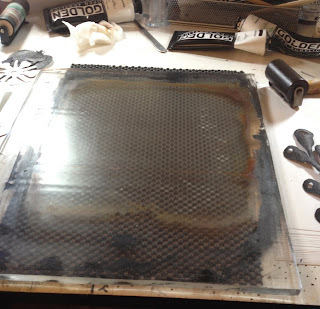 The large plate gives me the freedom to do that without the confining space of the smaller ones. I have room to ink more than I need and that way I am better able to compose and design my pieces with the added space. If you can afford it, I would suggest buying the larger plate. I think you will agree that you will feel freer. This is the large plate. I then go about inking my plate and laying out the design. I decide which part of the design I like and place my mat board over the area. 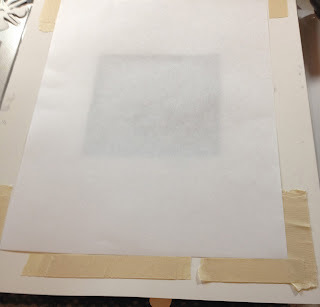 I have added tape to the corners where I want to line the paper up every time. The tape matches the corners of the paper. This board is for the 9" x 12" paper. I have a different board for each size of paper. I then snug the bottom of the paper up to the corner first and then the middle area. You should be able to feel the paper snug up into the corner and then the center. I then drop the paper onto the print area. I really like this way of registering. it is not too complicated. I call the tape "faux kento" marks since they are lined up the same way as kento registration marks in woodcuts. Florilegium BFK7, a photo by Roberta Warshaw on Flickr. I am finally feeling confident enough with my prints to use the "good paper". When I say good I mean good. I first used Rives BFK in a monoprinting class last spring at Mass Art. It was love at first feel. The paper is like velvet. And every single mark or texture prints so wonderfully. I bought a full pack of sheets and had used it for making some books but I hadn't used it for the gelatin prints. Let's face it, with the gelatin prints there is so much waste that I could not bear to waste a single sheet of this divine paper. But now, as I gain more proficiency with my printing, I am able to go ahead and use the "good" paper. The results have been beyond my expectations. Florilegium Ghost2, a photo by Roberta Warshaw on Flickr. I really thought I was finished with this series, but apparently the universe has other ideas. When I took my woodcut class a few weeks ago, I learned how important proper registration is. So for this series I followed the instructions for getting perfect registration every time. What a difference that makes! Each piece is 5" x 5' with a 2" border all around on a 9" x 9" sheet of paper. As you can see, at this size I have tightened up the composition with lots of overlapping. I rather like it. It looks like you are right down in the garden and can almost smell the plants. And here I thought I would be going bigger. 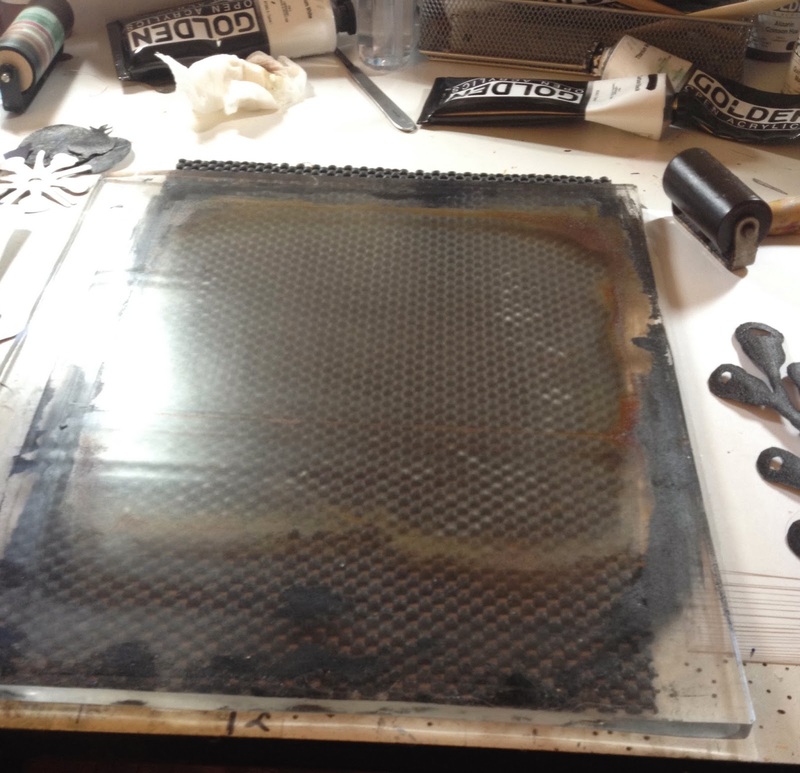 I even bought one of those giant gelli plates! Oh well. It does help to have a larger space to work on even if in the end it is only 5" x5". I can't seem to get enough of the ghost prints! collage on board, a photo by Roberta Warshaw on Flickr. I have been feeling a little bit uninspired as of late. That happens. It usually means I am tiring of the work and am gearing up for something new to surface. I have a love hate relationship with that state of being. Since I love being happy with the work and waking every day to the latest challenge it brings. Waiting for the new idea is a bit like "Waiting for Godot." Although unlike Godot, I know it will come eventually. So until then, I am playing with this new technique I learned and this time I did it on a clay board rather than a journal page. it felt good to be in the paint with a brush this time rather than the brayer. Journal1, a photo by Roberta Warshaw on Flickr. A few weeks ago I began an online class with Joanna Coles on transforming an old date book into a journal. I didn't have an old date book so I cheated and bought a new one. We began by gluing some of the pages together and then taping them and painting over the tape. That was as far as I got until yesterday when I stumbled upon a Jane De Fazio tutorial. I could really see myself trying this one and so I did and here it is. You can find the tutorial here. I still don't have words for it. That may come later. If not, so be it. It will have no words and be a sketch book of sorts. But I have a feeling I could actually write something in this. B&Wbookspread4, a photo by Roberta Warshaw on Flickr. It has been another rather unproductive week for me. Running errands for people, trying to get a swim in, school stuff, etc. On Wednesday things got so bad I could barely move. But I did make some new prints. I was so upset that I could only work in one color. That way I wouldn't have to think too much. So I just used black and white and some grey. I like the way they turned out in spite of my state of mind. I also printed with the gelatin plate for the first time on Rives BFK paper. I know it is expensive paper but if you do any gelatin printing, you should try it on Rives. You may never go back. You have been warned. The paper is rich and luscious and requires a bit of a firmer touch when you use your baren. I am going to try and put them all together to make a smallish book. I am not quite sure what type of binding I will do yet. I also need to figure out page imposition for it. That was always my worst moment as a graphic designer. 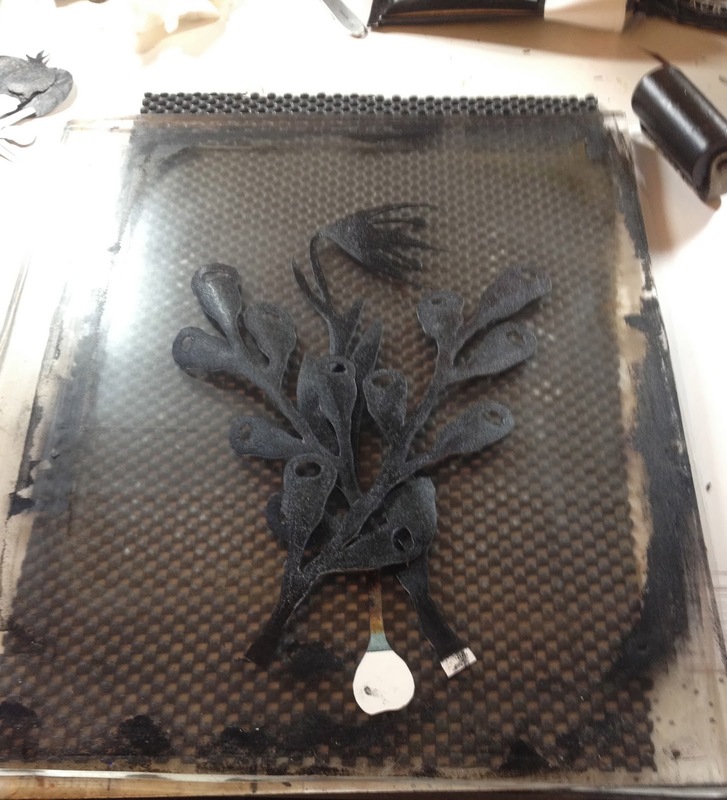 It is always easier to print when the book is already together but for these prints you just cannot do it that way. 57florilegium, a photo by Roberta Warshaw on Flickr. I haven't been in the studio much this week as it has been a very rough week. The parents, the grandson, life in general. I did scan in some of the newer works yesterday. I try and scan them in as I make them and go through them but I did get behind. Yesterday I scanned in over 20 new pieces. 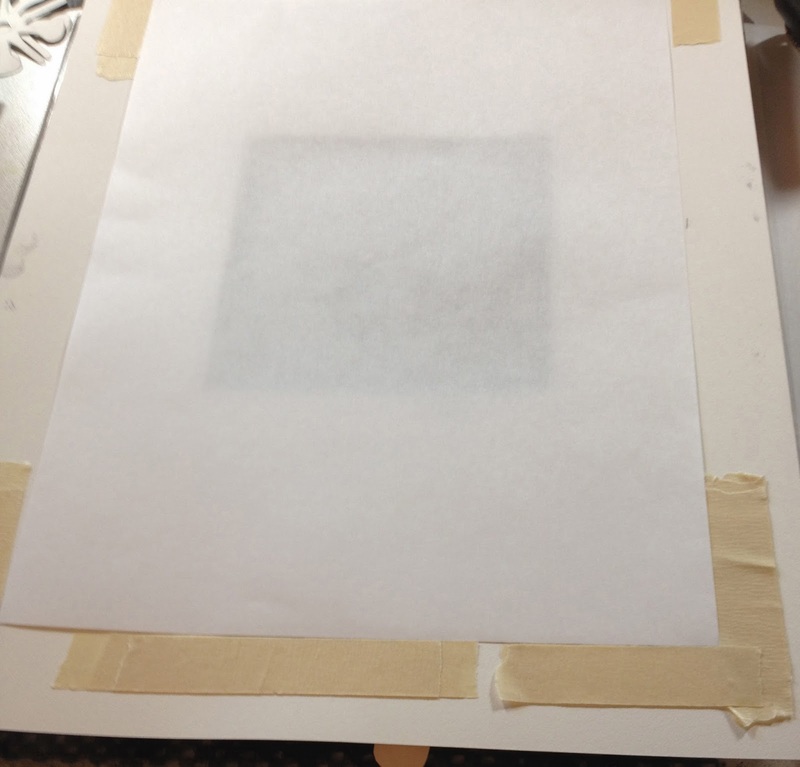 I am still quite enamored with the idea of creating ghost prints over ghost prints. It is an interesting process and one which I seem to have more control over than the non-ghost prints. At least in placement etc. I am still enjoying the process. I have been trying to create a journal as well. I was having some trouble with the whole idea of writing down my thoughts. It seems I am always worried about someone reading them and so I always censor myself or tear out the pages that really have meaning. I have to get past that somehow in order to succeed at journal writing. I decided to take an online class from Julianna Coles. Her work is extraordinary. I appreciate the way her journals are not all pretty pictures. You can feel her emotional state jumping off the pages of her journals. Very raw. She calls her work "Extreme Journaling". If you visit her site you will see why. Well, maybe I will get something done in my studio today. Enjoy the weekend.